I live in a small condo that does not have traditional washer/dryer hookups, but I hate hauling my clothes to the nearest laundromat. I've found the perfect solution in the form of the Supra SW5L30D, a washer/dryer combo unit that attaches to a sink faucet and runs off of 110 volt power. While not ideal for large loads of laundry, the unit does have several advantages. 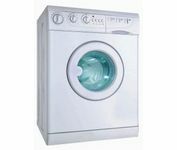 The cycle switches automatically from wash to dry, so you can throw a set of dirty clothes in, set the machine, and wake up in the morning with a fresh, clean outfit. Also, you can mount wheels to the bottom of the unit so that you can push it out of the way when not in use. With the convenience and size, however, come some negatives. The unit cannot accomodate a very large load of laundry. Five or six shirts, or two pairs of jeans, seems to be its limit. Also, the spin cycle can cause the machine to shift if it's not stabilized somehow, and, since I live on the second floor, I sometimes have to be careful about running it when my downstairs neighbors are at home. Overall, it is a convenient and innovative solution when space is at a premium. It should be noted that this is an older unit, however there are still some available. Supra has since been bought out by EdgeStar. Hi, thank you for sharing fantastic info. Was just browsing through the net in my office along with happened upon your blog. We are owner of bestessays It is definitely very well written and cigarettes comprehensive in explaining along with a very simple language. The machine looks very apt for minimalistic homes and small condos. The machine need not accommodate huge loads if the family is small and clean out their dirty stuff daily which makes the house clean and the machine effective.